Описание: Данные аудиокурсы - пособия созданы специально для Голливудских актеров с целью обучать их различным диалектам английского языка. Автор является общепризнанным специалистом в данной области. Его книги продаются по всему миру многомиллионными тиражами. 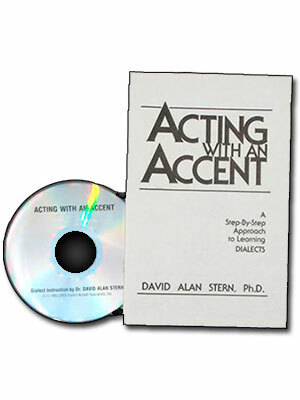 Acting With An Accent - David Alan Stern, "The Dialect Doctor," founded Dialect Accent Specialists in Hollywood in 1980. He has coached business executives, broadcast media personalities, government officials, actors, and members of the clergy to modify accents and speak more expressively for over thirty years. Among his celebrity trainees have been: Mike Farrell, Jack Klugman, Liam Neeson, Edward James Olmos, Bronson Pinchot, Lynn Redgrave, and Michael York, as well as Oscar winners Forest Whitaker, Geena Davis, Olympia Dukakis, and Sally Field. He has served on the faculties of both Wichita State and Penn State Universities, and is now Professor of Dramatic Arts at his Alma Mater, the University of Connecticut. These audio courses - manuals created specifically for Hollywood actors in order to teach them different dialects of the English language. The author is a recognized specialist in this field. His books are sold worldwide in millions of copies.